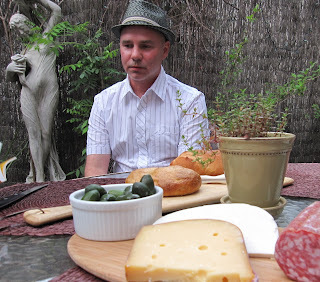 Our friend, Joe, has turned me onto a summer-lover of a cheese – Prima Donna. Maybe it’s the name I love -- it’s so pageanty. But no, the name is just the satin banner, and it happens to be perfect because Prima Donna is the Miss Universe of Gouda-style cheeses. Now, supposedly, this is not a real Gouda, according to a recent blurb in Culture, a new cheese magazine which I’ll post about shortly. Prima Donna doesn’t have quite enough fat content to live up to Gouda-hood (48% is required). Not a sad day, though. Prima Donna is my new salt caramel. Its sweet-salty, nutty-rich taste is great all by itself or with a pat of quince paste. But why gild the lily? I’ve been eating it straight out of the crisper, cut into strips, as if it’s celery. Shocking? Blame it on those flavor crystals, yes, yes, those little diamonds of what I now know to be lactic acid, something that only appears in an aged cheese. They dazzle me. They add a little crispy accent I die for. Who can explain? On a recent summer night, we paired Prima Donna with some Ricotta Salata, another one of Joe’s favorites. 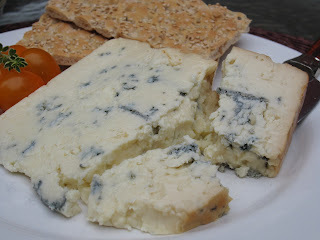 These two cheeses were great together – mild, summery, salty. I have always been a ricotta hound, but I’d never had this firm version of the soft Italian cheese I’m used to getting from my local cheese counter (love it with lemon zest and fresh basil, as a spread). I’m curious to try Ricotta Salata again, on its own, when the Prima Donna isn’t around to steal the stage. I stepped off the blue cheese path this week to wander into the realm of grillable cheese. That’s right, cheese you slap right on the barby. I first tried Halloumi earlier this month at London’s Borough Market, where a group of dreadlocked dreamers were grilling up Heavenly Halloumi Burgers. I waited in a long queue to buy one and soon realized I had been missing out on something wonderful. Halloumi is heavenly, if only because it makes such an easy, vegetarian summer meal. Ready the grill, cut the cheese into quarter-inch slabs, toss on the slices until they sizzle, and you’ve got the basis for a quick, savory supper. The Cypriots claim Halloumi as their national cheese, and friends who traveled through Greece this summer tell me you can’t spit an olive pit without hitting someone who is selling, grilling, or eating Halloumi, even for breakfast. It looks firm, like mozzarella, but tastes more like feta – pleasantly salty. It really is a lovely, light, summer cheese, and I can imagine it fitting in nicely amid sliced tomatoes and whole basil leaves in a grilled spin-off of a Caprese salad. It really does need to be eaten while it’s hot, though, which is why it makes compelling party food -- it's an impressive appetizer as friends are milling about the backyard. In the future, I'm going to try skewering it with veggies on kebabs, or, when figs are ripe: grilling fig and Halloumi kebabs drizzled with honey. (Alas, I have to turn everything into a dessert.) 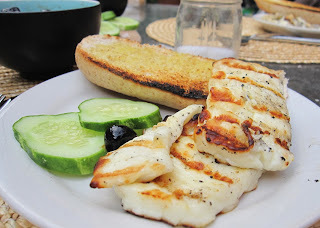 What I'm most curious about is whether any cheesemakers in the States are making Halloumi -- the Mt. Vikos brand I bought was decent, but it didn't make me do any shoulder rolls, you know what I mean? And at $13 a pop, I want to be undulating. Here is my favorite July day salad, and it’s so easy it’s laughable. 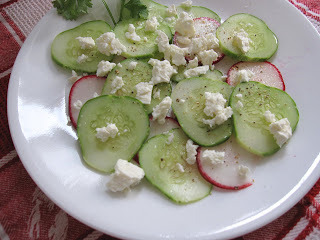 Sliced cukes and radishes, a whirl of olive oil, some dribbles of rice wine vinegar, and lots of crumbled feta. Bulgarian feta. Crack some pepper over it, and you’ve got a quick lunch for one or two or three or four, using all those cucumbers that are poking their Inspector Clouseau noses up through the garden weeds. Ask around. If you can find a cheesemonger who carries Bulgarian feta, run home and gorge yourself. I’ve noticed it popping up in other deli cases recently, usually in tubs, where the feta is bathing and lolling -- which might be the real secret. Those dry cubes at the grocery, all shrink-wrapped to look like blocks of Styrofoam insulation, are no good. You need to go to a monger who knows. Or to Bulgaria. My next adventure may just have seeded itself. A few weeks ago, a good friend asked me to pick up some cheeses to serve at his deck party. As he was a fellow Midwesterner, I thought I’d surprise him with a few heartland selections. No, I couldn’t find any cheeses from his home state of Nebraska, although I am sure those Cornhuskers dabble in dairy, but I did locate two blues – one from Iowa, one from Wisconsin – that managed to wow the crowd and kick up some Great Plains adulation. Moody Blue is, in fact, uber smoky, a whole lot smokier than Rogue River Creamery’s Smokey Blue, a pretty freakin’ fantastic raw cow’s milk cheese from Oregon state that gets its woodsy aroma from the slow burn of hazelnut shells. Its cult followers would probably get their sniffers out of joint if I didn’t mention that Rogue’s Smokey Blue has won first place at the World Cheese Awards (Best American Cheese, 2004), along with garnering numerous other cheese medals. Have I fawned enough? Maybe not. Think caramel, hazelnuts, blue cheese, now add fire. Let’s get back to Moody Blue, which has a lot more smoke and a little more bite. It’s the ultimate backyard bbq cheese, good for tossing on burgers, sexing up a steak, or just shocking the hell out of the unsuspecting nibbler latched onto a doppelbock. I loved the balance of sweet and salty in this cheese, and, yes, bacon, did come to mind. Along with licorice. And perhaps street fires. Just a few months ago, the U.S. Cheese Championship saw fit to crack a second place award on top of this, in the smoked cheese category. (Empire Cheese of Cuba, NY took first.) For a gander at all the smoky champions results, look here. In the meantime, put away your American Spirits, rip off your nicotine patch. If it's smoky flavah you crave, look no further than Moody Blue. Next time, I'm going to eat it on a cheesesteak.